If you read my post about the best bites of 2009, you have already heard what a fan I am of Rick Bayless. I love that he is an intellectual (previously a Mexican Literature PhD student) who supports sustainable farming and regional cuisines of Mexico. I finally had the time to get over to his new restaurant- Xoco- which focuses on Mexican Street Food. The menu has churros, food fired and grilled tortas (Mexican sandwiches). After 3 they serve caldos, or soups. I have to say, that was the best sandwich ever! I am not a huge fan of pork but I had to try it because it looked so good. It was tender pork carnitas inside of crusty freshly baked bread, with pickled onions. Then the sandwich was cut in half and standing in a bowl of spicy tomato soup. 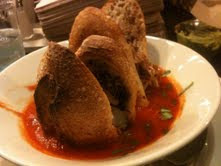 The bright and spicy flavors with the savory meat and crusty bread were perfect in every way. Steve had the tallgrass beef short rib sandwich with salsa verde. Also delicious. Following the sandwich, we had Mexican hot chocolate and fresh churros. Steve proclaimed it the best lunch ever and at 10% of what we spent at the fine dining restaurant Topo, a hell of a deal. I should also add- the customer service was fantastic even though we had to stand in line for over an hour. They don't take your order until they have a seat for you. There was a woman managing the line who explained everything, handed you a number when it was your turn to order, then seated you when there was a seat. I can't wait to go back here to try the soups!